In which Virgance quickly grows to pursue many projects and we investigate various paths for Carrotmob. Now that all the “housekeeping” of starting a company was finished, it was time to get down to business in early 2009. 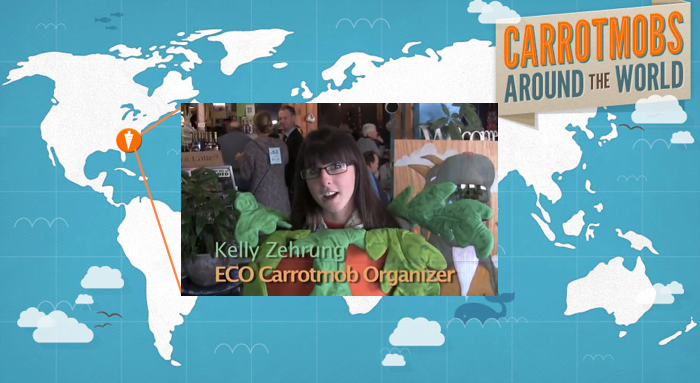 We had several projects to juggle within Virgance, but Carrotmob was off to a great start! We began to see more and more campaigns happening around the world, created by local community leaders. We worked directly with many organizers, and developed basic tools and materials to help them out. We redesigned the Carrotmob website, launching city-based blogs and gave local organizers administrative control over their city’s blog to use as an organizing tool. We put together our famous cartoon video. But the key to really making Carrotmob go big was getting a revenue model in place. We couldn’t really invest in hiring people without that. We had about two dozen ideas floating around, and during the first half of 2009 we researched them and identified some promising models. First we were thinking about Facebook apps. Remember when Facebook apps first came out and they were this huge new thing? Yeah, well we got excited about that for a minute. Then we moved on to the idea of a Carrotmob payment card. We had some cool ideas about how people could participate in Carrotmob campaigns just by paying with their Carrotmob cards. We would be able to track all the data about how much the mob was spending, and we would have proof of our spending, so that we wouldn’t have to rely on businesses always telling the truth about how much was being spent. The whole industry of co-branded and “affinity” payment cards offered a percentage of spending to the partner, so the basic plan was to create Carrotmob cards, get paid a commission by banks, and use that revenue to take Carrotmob to the next level. We had some very cool ideas related to these Carrotmob cards, and actually secured a provisional patent for one related idea. But suddenly, our discussions with banks ran into a brick wall. In May 2009, Congress passed a bill to change the entire credit card industry. All these banks freaked out and had to change all sorts of things they were doing. In the process they lost all interest in doing the type of project that we were interested in, and started canceling affinity programs left and right. So by summer 2009, Carrotmob’s revenue model was suddenly back to square one. It was a little insane that we had so much going on so quickly. Definitely insane. We had only raised $750k and we had tackled so much! We were spread way too thin, and realized that the only sensible path was to put all of these projects on the backburner and put our resources into the one project that was actually growing fast and making money: One Block Off The Grid. That would be “the rising tide that would lift all boats,” so to speak. Of course, everyone had their own projects they were most excited about. I wanted to work on Carrotmob. But I also had a responsibility to do the best thing for the whole company, so Carrotmob stopped getting resources. Essentially, all of our projects had a fraction of a person working on them. I spent most of my time on general Virgance stuff and projects for One Block Off The Grid, and continued to work long hours and evenings to support Carrotmob organizers and keep things rolling. Thankfully, in addition to assorted Virgance staff, there have always been many fantastic volunteers who have jumped in at some point to help us out by answering emails from Carrotmob organizers, helping set up websites, developing materials, etc. These include people like Susanna S, Jen D, Sinclair S, Jacob P, Kim S, Curtis L, Erica E, and more. 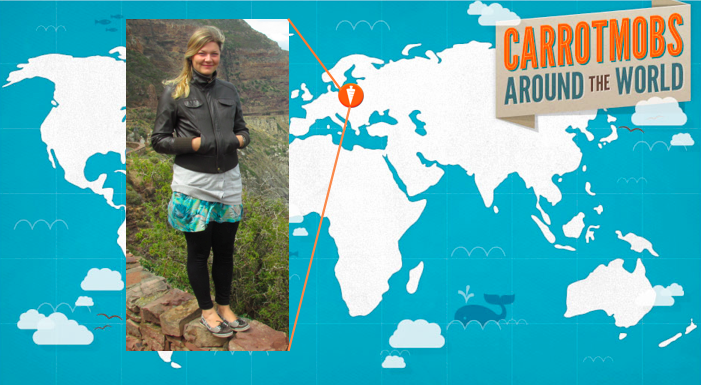 Starting in the summer of 2009, our hearty band of Carrotmob supporters prepared to wander the desert for the rest of the year….